We are involved with programmes to advance international understanding, improve world health and education, goodwill and peace. We strive to alleviate the effects of poverty. The Rotary Foundation is the Charitable Trust of the Rotary movement. In 1985 the Foundation set up the PolioPlus project to eliminate polio from the face of the earth; today polio is endemic in only three countries of the world, and the Foundation is spearheading the final thrust to eradicate this crippling disease. See our page End Polio Now. Locally we help to ensure the continued provision of funds for the Foundation, and seek out and support projects which fulfil its aims. We help with the selection or support of students on a number of Foundation educational programmes. We organise a civic reception for Rotary Scholars and Peace Fellows in the district and assist other club members with District and Global Grant Applications. Our fund-raising events support projects at local and international level. 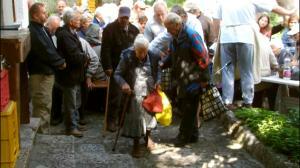 Funds raised also provide support for other appropriate charities and disaster relief. With many other Rotary clubs and their supporters in Yorkshire, the club has contributed to the total rebuilding of a tsunami devastated school in eastern Sri Lanka. We have sourced and supplied some 80 beds to hospitals in Ternopil, Ukraine. We have funded the supply of equipment to a health centre and maternity unit in a remote area of the Democratic Republic of Congo. For the Kenyan Orphan Sponsorship Trust with the addition of a Rotary district grant we have funded a project to supply computers and associated educational aids to their school in Kenya. Rotary Club of Braunschweig - Richmond - we maintain, on behalf of the club, relations with our twin club in Germany. 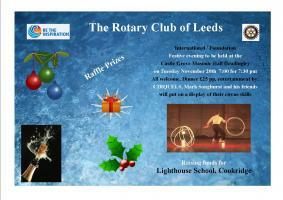 An evening of festive fellowship to raise funds for Lighthouse School, Cookridge. This event is now fully-booked. 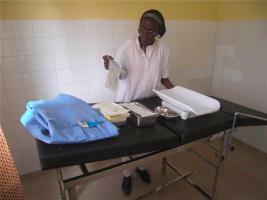 Changing life in Kingankeno, Democratic Republic of Congo, thanks to a Matching Grant. 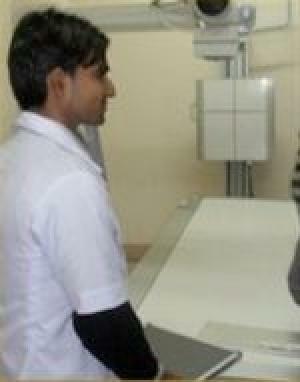 We supplied X-Ray equipment for a spinal injuries rehabilitation centre.